In 2012 Dr. Lucy Ozarin was interviewed at the National Library of Medicine as part of an oral history project related to the US Navy Bureau of Medicine and Surgery (BUMED). In honor of our remarkable friend and colleague Circulating Now offers excerpts from that interview today on the occasion of her 100th birthday. Lucy volunteered at NLM from 2004 to 2013 researching and writing biographies of notable American psychiatrists and curating NLM’s Diseases of the Mind website. Before her service with us as a medical historian, Lucy earned a living as a psychiatrist. From 1943 to 1946, she served in the Navy where she earned the distinction of being one of the first women psychiatrists commissioned in the Navy (and only one of seven women Navy psychiatrists in World War II). Happy Birthday, Lucy. BUMED: Before we delve into your remarkable career I want to capture a bit of your early life. Where were you born? Lucy Ozarin: I was born in Brooklyn in 1914. We left there when I was about seven and moved to a small town on Long Island and I was there throughout my childhood and education. I went to Lawrence High School in the next town, since we did not have a high school in my town. Then I went to New York University…. Then I went to medical school at New York Medical College….I graduated from medical school in 1937. After that I interned at Harlem Hospital for two years…. I got out of Harlem in 1939 while the Depression was still going on. I had no money. We weren’t wealthy and I couldn’t go into practice. The choices were to work in a hospital, either tuberculosis or a mental hospital. I thought psychiatry would be less “catching.” I got a job as a resident in Westchester County. The Westchester County Hospital had a small psychiatric unit. I was there for about seven months and then my father had a stroke. I then left Westchester and got a job at the Gowanda State Hospital, 35 miles from Buffalo where my family was living. I stayed there for three years and saw what a state hospital was like. BUMED: What were your impressions of Gowanda? LO: It was rural. We drew patients from Western New York. State hospitals were not very good in 1940. After the war broke out and the men on the staff left, I was the only physician for a thousand patients. Which is impossible of course. BUMED: After being sworn in did you go through an indoctrination course? LO: I had no indoctrination. I put on a uniform one day and went to Washington. My father had died the same week I was sworn and it was a very emotional time. But as I say, I put on the uniform and reported to Bethesda. I didn’t know how to salute. I came to Bethesda and was assigned to psychiatry. The man in charge of psychiatry was CAPT [Forrest] Harrison. He was an older man and he was very warm-hearted. I stayed in Bethesda at that time from October 1943 until February 1944. The hospital was a beautiful structure and on the land around they began to build the temporary wards. There were lines of wards on both sides of the hospital… after four months I got orders to go to Camp Lejeune. I was there for about six weeks. It was very unsatisfying…. 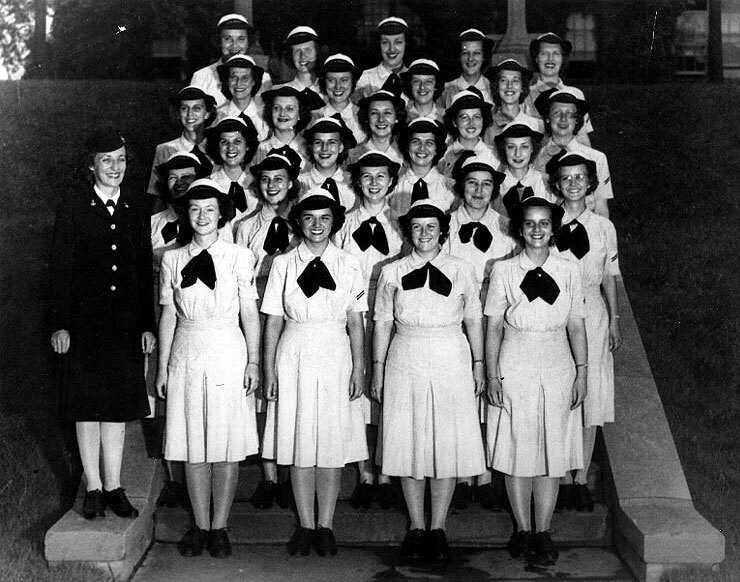 WAVE Yeoman Class, Naval Training Center, Women’s Reserve, The Bronx, New York (Hunter College). Graduation photograph, circa summer 1943. There were two women physicians on base and they had been assigned to the dependents clinic located outside the base. I don’t think the commander of the hospital knew what to do with me. I got the feeling that he wasn’t sympathetic to psychiatry. You have to realize that in the forties psychiatry was still something that meant state hospitals and “crazy people” to most of the population…. I was told to examine laborers who had applied for jobs at the hospital. Here I was doing physical examinations. I already had four years of experience in psychiatry and this job did not seem appropriate…. After a few weeks I wrote to one of the fellows I met at Bethesda and I’m sure he took my letter to CAPT Harrison because I got orders to go to the WAVES training station at Hunter College in New York. That was an interesting experience. BUMED: What were you doing at Hunter College? I moved back to Bethesda and found a room. It was hard work. One month I had 77 admissions. By that time George Raines was in charge of psychiatry at Bethesda. He was very strict and don’t think he knew how to deal with women psychiatrists. One day Francis Braceland came in. He was the head of psychiatry at the Surgeon General’s office. George went around the room and introduced every single physician on his staff until he came to me and then he skipped me completely. This amused me. He didn’t pay much attention to me until one day when he said at a staff meeting that he had looked at the admissions and saw that I was handling more than any of the men. In time, I became a friend of George and we became fond of each other and he was supportive of me…. There were many WAVES in Washington. We got a lot of admissions, especially from those from the Communications Bureau. One of the big problems was that they functioned around the clock with three shifts and it was difficult for some of the girls to adjust. They became anxious. They became irritable. They didn’t feel good so they landed in Bethesda. I would talk to each of them. Some would go back to duty and overtly some wanted out. These were very young women and some could not adjust to the living quarters…. BUMED: Did you finish your service at Bethesda? LO: I stayed at Bethesda until 1946 when they were beginning to discharge the physicians. I got time to study at St. Elizabeth’s when I was in service. I took my boards in 1945 and passed them for the first time. The boards for psychiatry and neurology was established in 1934…. It was a terrible ordeal and I vowed I would never again take an examination…. I went down to the VA’s central office and met Harvey Tompkins. He was head of Hospital Psychiatry then…. I talked to Harvey for about ten minutes then he took me into his boss, Dan Blain and I got hired by the VA, just like that…. At that time the VA was a growing concern with all the thousands of veterans being admitted. Yet the hospital had all this backlog of chronic patients. I think there were more psychiatric casualties at the VA than any other diagnoses. The VA had 41 mental hospitals all across the country. And in time I visited every one….I had a very satisfactory stay in the VA…. 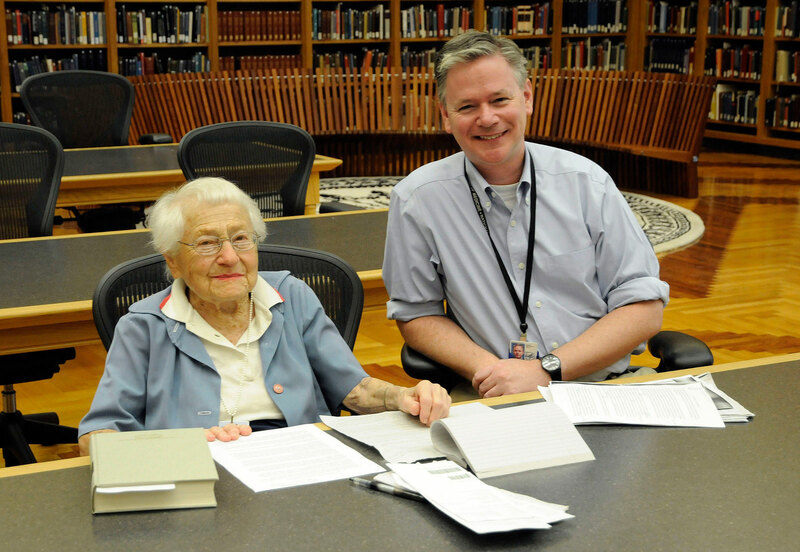 Lucy Ozarin and Michael North in the History of Medicine Division reading room. I decided to pursue a career in Public Health, which was very important in those days. I came back to Washington to the Public Health Division of Psychiatry and stayed there until I retired. In the Navy, I met all of the big names. Right now, one of my assignments here is to write brief biographies of psychiatrists for Wikipedia. This has been going on for two years and I have written 53. I hope they will make it to Wikipedia eventually. Now I have just done a draft on Larry Kolb….He was in the Navy and had the ward next to mine…. I must tell you about one incident….One day a young sailor came to see me. This was in Ward 137. That was the WAVES NP Ward. He came because his girlfriend had been admitted to my ward. She was one who didn’t want to be in the Navy. But she was upset because she found herself engaged to two sailors. I recognized this young sailor was very tense and upset. I was upset because of seeing him. I got up and went next door to talk to Larry, but he didn’t help me much. And I let this sailor go. Well, a week or two or three later his father came to see me. This boy had drowned himself. And it’s one of my regrets of my life. I wish I could have done something for him. He wasn’t anyway connected to a medical situation, but I regret it…. I’ll tell you another incident I remember. Ward 137 was over the patients’ laundry. In summer, when the dryers were on, it got incredibly hot. Well, we got inspection every week and one day the commanding officer came to the ward. He was a very nice fella. I went around with him and said put your hand on the floor. The laundry got shut down the next day. That was a wonderful example of taking action. But it took a commanding officer to do something. We didn’t have air conditioning in those days, and it was hot. BUMED: Overall you have fond memories of your service in the Navy. LO: The Navy was an instructive place for me because I rubbed shoulders with the greats in psychiatry. That was my real introduction to the field. I had a very good experience in the Navy, except for Camp Lejeune. Great story. Love all your posts. Always so interesting. So glad you enjoyed reading about our friend Lucy. Thanks for your kind words.